Thomas Jefferson's Natural Passion Thomas Jefferson was the third president of the United States. He was an architect, an inventor and a statesman. But his passion was nature. Host Liane Hansen visits Monticello, Jefferson's primary residence on a mountaintop in Virginia, and tours Jefferson's magnificent gardens. Thomas Jefferson was the third president of the United States. He was an architect, an inventor and a statesman. But his passion was nature. Host Liane Hansen visits Monticello, Jefferson's primary residence on a mountaintop in Virginia, and tours Jefferson's magnificent gardens. The image of Monticello, the home of Thomas Jefferson, has graced the reverse side of the American nickel for most of the past century. The domed roof, the four columns beneath and the pavilions extending from the center like a pair of open arms are an impressive sight. Last month I visited this majestic estate atop a mountain near Charlottesville, Virginia for the first time. The house is a testament to the architectural genius of America's third president, but that's not all there is. When I wandered down a small hill on one side of the mansion, I found another testament to Jefferson's genius - a lush green and long rectangle filled with perfectly straight rows of countless plants. Mr. KEITH THOMSON (Author, "A Passion for Nature: Thomas Jefferson and Natural History"): This was the main vegetable garden. He started it at 690-something feet long and it's about 40 feet wide. And he divided it into 24 rectangular plots. And Jefferson's one of these people where everything had to be amazingly precisely measured and squared off and so on. And there were plans from the years right through towards his death of where everything should be planted in the rows in the plot. HANSEN: Keith Thomson is the author of a book called "A Passion for Nature: Thomas Jefferson and Natural History." I met him on the day of my visit to talk about the garden that illustrates the third president's passion. We sat in a small brick pavilion in the middle of the garden and looked across the rows. Mr. THOMSON: Well, basically divided in his day between what he called the fruits, which was things like peas, peppers and so on, and the root vegetables and then the leafy vegetables. But the distinction was never quite that precise, but it is, I think, it's one of the most extraordinary gardens that exists anywhere. HANSEN: And on the other side of the garden we're looking out toward the wonderful - the valley. Mr. THOMSON: We're on the top of 1,000-foot mountain, Monticello, little mountain. He used to come here and read and survey everything. Mr. THOMSON: And I must admit, I can't imagine anything better than having a pavilion in one's garden where you can look from the top of a mountain to survey a lot of stuff you actually owned. HANSEN: Thomas Jefferson, this garden, I mean, this was designed to feed the people who lived and worked here. Mr. THOMSON: Indeed, yes, and it was a large number of people. He had his two daughters and tons of grandchildren. And when he stopped being president, every day there were hangers-on coming by and people would arrive from Europe and come to visit unannounced. HANSEN: And they had to be fed. Mr. THOMSON: It used to drive him crazy. HANSEN: Thomas Jefferson built and rebuilt Monticello over the course of 40 years. He was an architect. He designed the University of Virginia, as well as Monticello. He was a politician, governor of Virginia, congressman, secretary of state and, of course, president. He was an inventor. And in an age before the word was a term of art, Thomas Jefferson was a scientist. He loved to tinker, to create and to experiment. Mr. THOMSON: Everything he grew in this garden was a result of an experiment. If he didn't like a variety, he would just throw it out. I suppose one way to answer the question is to say what were some of the failures. Mr. THOMSON: He was very enthusiastic about the sugar maple as a way of getting sugar without having to import it from the West Indies. So he tried sugar maples here, but the climate is not quite right. They tried grapes, and for some reason or other, which is odd because Virginia now is a major wine-growing part of the eastern United States, they could not establish a really good vinery. HANSEN: When did he have time to garden? Mr. THOMSON: Well, this is extraordinary. When did Jefferson have time? Well, he was always doing five things extremely well. When did he have time to do them? I think the fact is that he didn't garden so much as tell people what to grow and they tended it. HANSEN: Most of the work was done by slaves. They planted the leafy greens and root vegetables, as well as the fruits and herbs, in precise rows side-by-side along the length of the garden terrace. HANSEN: What was Thomas Jefferson's philosophy about space? I mean, it's just interesting that this vegetable garden is so very formal and rectangular. HANSEN: And we haven't seen the flower garden yet, but I understand it's designed completely different. HANSEN: Did he have sort of contrasting ideas about space? Mr. THOMSON: So much about Jefferson is sort of contrasting. And you think you've got a grasp on him and then you realize he's wriggled away. On this side of the house where it's all functional, it's all extremely ordered and tidy and in mathematical rows, and that's exactly what you want to do if you're going to control nature. And remember, this was the wilderness. This was a mountaintop in the forest. And except where people had cut out fields, it was forest from here as far as you went west. So controlling nature was terribly important. But around the house itself, here he wants to have a continued sense of the wilderness. He's very careful about shaping what looks like wilderness, but is actually a very controlled romantic environment, where there's not one single straight line. HANSEN: I read in your book that Thomas Jefferson's favorite vegetable was the pea. Mr. THOMSON: A pea. Yeah. Mr. THOMSON: Yes. And this is one of the things that he really experimented with and Leadman's Dwarf was the variety that he liked most. And this is a very good climate for growing peas, I must say, a short season. HANSEN: Isn't it pea season? HANSEN: No. What are we - let's see what we're looking at. Those look like carrots. Mr. THOMSON: Well, we've got, that surely is carrots. Mr. THOMSON: Yes. And this is oregano or marjoram. And behind it is some kind of a vine. Mr. THOMSON: That might be a pea, yes. They - oh no, it's a bean. HANSEN: They're such perfect rows. I mean, they're just so, it's mathematically just, you know, straight. Mr. THOMSON: Right. So this is the - we're now at the end of vegetable garden and we can cut across into the distant part of the flower garden. HANSEN: The contrast between Thomas Jefferson's vegetable garden and his flower gardens is remarkable. Instead of rigid mathematical rows, there are soft curves, winding walks and bright fragrant flowers. HANSEN: Oh, it's a wonderful oval. Mr. THOMSON: Yeah. And you see how funnily the - all the straight lines that were in the house somehow go perfectly well with the straight lines in the vegetable garden. Mr. THOMSON: And yet the curves go well with the sort of large oval walk. As you see, no straight lines in here. HANSEN: None at all. Look at this, an Amaranthus, Love-Lies-Bleeding, Asters, pink, I think. Mr. THOMSON: A straw flower. Mr. THOMSON: Name that plant. Yeah. So now we're coming to the house itself, which is built in this U-shape, the main house in the middle. And then the ends of the two arms, these pavilions. HANSEN: Monticello was the laboratory for many of Jefferson's inventions. The Great Clock driven by cannonball weights, which hang on either side of the front door. The polygraph sits on his desk. When Jefferson wrote, his pen would be attached to a device with several arms, each with another pen hovering over a piece of paper, so copies of a document were made as it was being written. Jefferson also designed a revolving bookstand that allowed him to consult five books at once. The diverse interests of this Renaissance man enabled him to design a house, fill it full of inventions, then masterfully sculpt the landscape surrounding it. HANSEN: Thomas Jefferson expressed and fulfilled his passion for nature through the gardens at Monticello. And he spent as much time outdoors as he could. Mr. THOMSON: Whenever he was not in office somewhere, he would ride his horse two or three hours every day supervising everything, singing. And then the pavilion where we were, he would sit out there and read. And when he was stuck in Washington and in Philadelphia, or, and in Paris, he just hated it. He really wanted to be back here at this little mountain. HANSEN: Keith Thomson, author of the book "A Passion for Nature: Thomas Jefferson, A Natural History." HANSEN: Our visit to Monticello, the founding father's little mountain, was produced by Sarah Beyer Kelly. 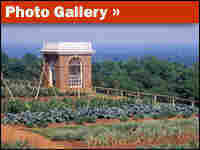 And there are pictures of Thomas Jefferson's garden at npr.org.